Background: Few studies have been conducted that have compared electrical source localization (ESL) results obtained by analyzing ictal patterns in scalp electroencephalogram (EEG) with the brain areas that are found to be responsible for seizures using other brain imaging techniques. Additionally, adequate studies have not been performed to confirm the accuracy of ESL methods. Materials and Methods: In this study, ESL was conducted using LORETA (Low Resolution Brain Electromagnetic Tomography) in 9 patients with lesions apparent on magnetic resonance imaging (MRI) and in 6 patients who did not exhibit lesions on their MRIs. EEGs of patients who underwent surgery for epilepsy and had follow-ups for at least 1 year after operations were analyzed for ictal spike, rhythmic, paroxysmal fast, and obscured EEG activities. Epileptogenic zones identified in postoperative MRIs were then compared with localizations obtained by LORETA model we employed. Results: We found that brain areas determined via ESL were in concordance with resected brain areas for 13 of the 15 patients evaluated, and those 13 patients were post-operatively determined as being seizure-free. Conclusion: ESL, which is a noninvasive technique, may contribute to the correct delineation of epileptogenic zones in patients who will eventually undergo surgery to treat epilepsy, (regardless of neuroimaging status). Moreover, ESL may aid in deciding on the number and localization of intracranial electrodes to be used in patients who are candidates for invasive recording. The clinical benefits of information derived from ESL were first shown in patients with lesioned epilepsy. ,, Some recent studies have shown furthermore that the brain area causing the seizures in temporal lobe epilepsy (TLE) and extra-temporal lobe epilepsy (ETLE) could be determined using ESL, even when the disorder was not detected in MR images. , However, very few studies have utilized ESL in recent years to determine the location of the epileptogenic zone in ETLE, especially in cases where MR images appear normal. This can be attributed to the fact that such attempts require well-planned prospective studies, which should be based on long-term surgical outcome and sufficient number of patients in order to be meaningful statistically. To investigate the effect of scalp EEG ictal activity on the performance of ESL. The data examined in our study were from 15 patients with drug-resistant focal epilepsy who were candidates for surgery. Informed written consent was obtained from each patient, and the study was approved by the ethics committee of the Istanbul University, Cerrahpaşa Medical Faculty. Underwent pre-surgical evaluation and long term video-EEG recording . Had post-surgical MRI performed according to an epilepsy protocol. Had surgery and follow-up for at least 14 months. The characteristics of all the patients are tabulated in [Table 1]. The age range of patients was 5-47 years. (mean: 23.07; median: 23). Five of the patients were female. In pre-surgical evaluations, the epileptogenic zone of 11 participants was described as temporal, and that of four patients was identified as extra-temporal. The pre-surgical evaluations included neurological examinations, long-term video-EEG monitoring, MRI performed according to an epilepsy protocol, fluorodeoxyglucose positron emission tomography (PET), and neuropsychological evaluation. Eight patients underwent a second evaluation phase involving intracranial recording. Long-term video-EEG recording with 64 scalp electrodes (SynAmps; Compumedics Neuroscan, Charlotte, NC, USA, or SD LTM64 Headbox; Micromed, Italy) was performed on all patients using a standard clinical EEG setup. Electrodes were placed according to the 10-20 montage international system. Impedances were below 5 kΩ. The signal was sampled at 256 Hz and digitized, and the stored data was off-line filtered using 0.5-100 Hz band-pass digital filters. Ictal spike activity: A wave in the form of spike recorded during epileptic seizures. Three or more discharges in sequence. Rhythmic activity: EEG waves (alpha, theta or delta) that is up to 13 Hz frequencies. Paroxysmal fast activity: The rhythmic activity that is bigger than 13 Hz frequency. Obscured activity: Pattern evolves from artifact such that precise time, pattern, and distribution of onset was imperceptible. Advanced Signal Analysis (ASA) software (ANT Software, Enschede, The Netherlands) was used for selection, detection, and analysis of scalp-EEG ictal patterns. For ESL with LORETA analysis, seizures were divided into several events subsequent in time. Time analysis windows of each event ran from the start to the end of the change in amplitude. MRI scans for all patients were acquired as a part of the post-surgical evaluation with 1.5 T scanners according to an epilepsy protocol. These post-surgical MRI scans were used for obtaining an individual head model for each patient. T1-weighted sequences with pixel size of 0.98 mm 2 , and slice thickness of 1.25 mm were used to obtain three-dimensional (3D) MRIs. In order to construct individual head models, geometrical boundaries of brain were defined using anatomical marker points (nasion, and right and left tragi), which are identical to those used in 3D MRI. The same spatial reference was identified for neurophysiological and structural data. The Boundary Element Method (BEM), being one of the most preferred methods, was also used for individual head models. Based on this method, segments of the three compartment surfaces (brain, skull, and scalp) were described by 4000 nodes per head model. According to this data, a realistic EEG transfer matrix was calculated. ASA software was used for the processes mentioned above. Specific conductivity values attributed to the brain, skull, and scalp of each patient were 0.33, 0.0042, and 0.33 Siemens/meter, respectively. The low resolution electromagnetic tomography method (LORETA) was used to determine brain electrical sources. LORETA is a Laplacian weighted minimum norm algorithm, which depends on the existing neuro-anatomical and physiological knowledge and a mathematical constraint. The method is based on the reconstruction of the electric activity of the brain onto all of the points of a 3D grid. Every point whose activity is reformed is considered to be a potential source localization; therefore, a presumed number of sources is not necessary for the model, unlike dipole source modeling methods. In this method, the smoothest spatial distribution is selected by minimizing the Laplacian of weighted current sources. The assumption is that neighboring voxels should have a maximally similar electrical activity, such as the same orientation and activation. The significant feature of LORETA is that it facilitates inverse solution by providing spatial coefficients as input. This property is coming from the result of its time independency. To generate a combination of sources, it is enough to have one-time sample. Hence, we divided EEG activities into time windows for a solution, and these temporal windows were analyzed between the time of seizure onset and ∼ 4 seconds later. The LORETA map at the time of visible seizure onset, or appearing at the time of seizure semiology, was selected. The anatomical information obtained from the results of LORETA is given in [Table 2]. The ESL group assessed using scalp EEG ictal spike activity included six patients. Of these, three patients (Patients 6, 11, and 15) were classified as having TLE, and the remaining three patients (Patients 1, 4, and 8) were classified as having ETLE. The ESL group assessed using scalp EEG rhythmic activity included four patients. One patient (Patient 3) was classified as having ETLE, and the remaining patients (Patients 10, 12 and 13) were determined as having TLE. The ESL group assessed using scalp EEG paroxysmal fast activity included four patients and all of them (Patients 2, 5, 9, and 14) had TLE. The ESL group assessed using scalp EEG obscured activity included 1 patient and that person (Patients 7) was classified as having TLE. Nine of the postoperative patients with TLE were seizure-free. The epileptogenic zones that were obtained using LORETA method for ESL showed overlap with the resected area [see [Figure 1]]. Two patients with TLE and four patients with ETLE were operated on after intracranial recordings were performed, because their MRIs were normal. For four of these patients, the epileptogenic zones obtained using LORETA corresponded to the resected area. LORETA method used in this study identified an area adjacent to the resected area as being related to the seizure in one patient with TLE [Figure 1], #13]] and in one patient with ETLE [Figure 1], #4]]. The ESL found using LORETA source model identified zones that were wider than the resected area for six patients. The distribution of patients classified postoperatively according to the Engel classification of outcome is given in [Table 3]. Briefly, 11 patients with TLE, three with parietal lobe epilepsy (PLE), and one with frontal lobe epilepsy (FLE) were followed-up on over the course of at least 1 year postoperatively. All of these patients were seizure-free and belonged to Engel class I. After their operations, it was confirmed that the source localizations obtained using LORETA coincided with the same zone as the region that caused the seizures in these patients. The zone adjacent to the resected brain area was identified using LORETA for one patient with TLE and one patient with PLE who both had fewer seizures postoperatively. The resections identified the parietal lobe in three patients, the frontal lobe in one patient, and the temporal lobe for 11 of the 15 patients, and all of them were single-lobe resections. 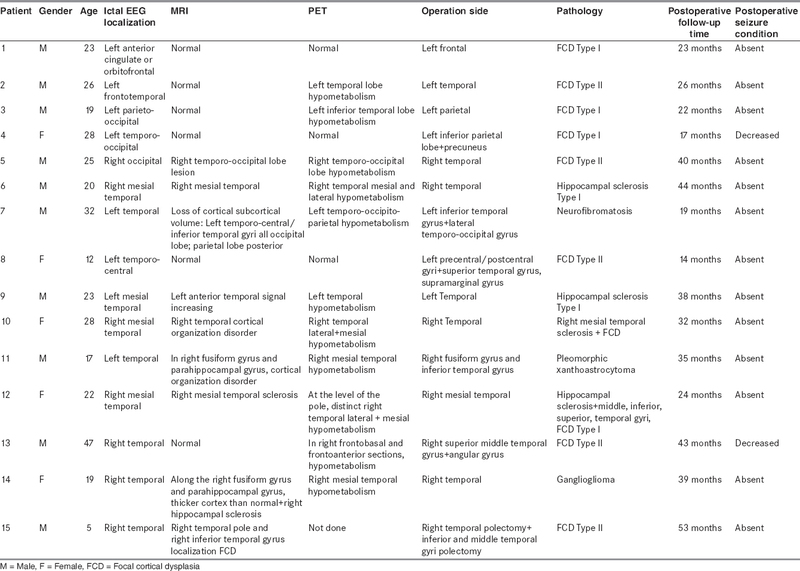 Histopathological analysis of the resected tissue showed focal cortical dysplasia (FCD) for eight cases, hippocampal sclerosis for two cases, both FCD and hippocampal sclerosis for two cases, ganglioglioma for one case, pleomorphic xanthoastrocytoma for one case, and neurofibromatosis for one case. Comprehensive investigations are required preoperatively to determine the epileptogenic zone accurately. It is still difficult to determine epileptogenic zones for patients whose lesions cannot be detected with MRI or discordant imaging results using imaging methods. In this study, the zone determined using distinct types of scalp EEG ictal patterns was confirmed by comparisons between ESL and the resected area. Methods based on solution of the inverse problem are used to obtain a physiologically meaningful source image although a unique solution is not possible to reach especially when physio-anatomical restrictions or boundary conditions are not very tight. The reason why we chose LORETA among other available methods that use inverse solutions was that low-resolution methods can successfully estimate primary active zone though with a weak spatial resolution. ,,, This method is a useful tool to reconstruct basic source configurations, but not huge amount of unconstricted sources in a determined region. In addition, time independency is one of the most important characteristics of LORETA, so that localization of a combination of sources could be performed by just one time sample. Furthermore, no pre-assumption about the number of sources is needed in LORETA method. In the present study, confirmation was achieved by assessing the extent of overlap between the zone obtained by using LORETA and the area resected during surgery. Outcome of the surgery was also considered. In our study, we were able to achieve an accurate ESL with LORETA for 13 of the 15 patients studied. The scalp ictal EEG of the remaining two patients (Patients 4 and 13) displayed ictal spiking and rhythmic activity. Ictal EEG records play a significant role for practical applications related with clinical matters like seizure propensity, seizure control, and drug-related neurotoxicity. Our findings support the results of Clemens and colleagues' study (2010),  which demonstrated that LORETA should be a beneficial tool for research on the matters mentioned above. This fact is supported by the insufficiency of other neuroimaging methods (magnetic resonance imaging methods, positron emission tomography) on this sort of problems. The resected brain area was correctly assigned in our study using LORETA for one postoperatively seizure-free patient whose scalp ictal EEG activity consisted of obscured activity. From this view point, our attempt seems to be a relatively successful one when compared with the study of Koessler and colleagues (2010),  who performed ESL using scalp EEG ictal data for nine patients (two of them with normal MRIs) with LORETA and assessed the accuracy of their ESL results by examining the determined epileptogenic zone using intracranial EEG recordings. Although they were able to identify the epileptogenic zone accurately for seven patients with abnormal MRI and determined accurately the area causing the seizures for one of the two patients with normal MRIs, they failed to do the same thing for the other patient whose scalp EEG ictal activity had consisted of obscured activity. An area overlapping with but somewhat wider than the resected region was estimated to be epileptogenic using the ESL data obtained from LORETA for six patients. In three of these patients, it was observed that the scalp EEG was composed of spike activity. Of these three patients, two had rhythmic activity, and one had obscured activity in their scalp EEG. This can be interpreted as that the determined wide area is resulting from each possible current source localization that arises from the measured EEG's topographic representation on the surface of the scalp, as reported by. In addition, it is suggested that distributed models are not sufficient to determine the epileptogenic zone when they are used alone, but they can provide valuable knowledge, especially in cases in which information regarding seizure propagation is needed. LORETA source model are more proficient in localization of widespread regions compared to localizing limited areas. Michel et al. (2004a, b) , points out that using MRI scans of individuals is beneficial in determination of an epileptogenic zone with a single dominant focus, which was the case for our patients. Therefore, one reason why in our study the epileptogenic zone determined by using LORETA is concordant with the resected area for postoperatively seizure-free patients, may be because their individual MR data were used to construct the head model. From this point of view, our results are in line with those of  who used the patients' own MRI to construct the head model for ESL and reported their localization precision with a sensitivity of 84% and specificity of 88%. In this study, histopathology of resected tissue from the patients revealed FCD and hippocampal sclerosis. An accurate ESL could be achieved by using LORETA despite these disparate histopathological results, suggesting that successful ESL is possible even in cases no histopathological information is available. Based on verification using postoperative MR images of patients, it is demonstrated in this ESL study that accurate estimation of epileptogenic region is possible by employing the LORETA method. Our results suggest that the information obtained by means of LORETA can be used in planning surgery according to the type of epilepsy and its most likely sites in the individual patient. For clinicians who are in need of noninvasive methods based on advanced quantitative EEG that can accurately identify and localize the epileptogenic zone in higher number of candidates for surgery, the results of the present study are promising. I am thankful to my thesis advisor Professor Çiğdem Özkara, my co-supervisor Professor Mustafa Uzan and Professor Pekcan Ungan for providing extensive comments and discussions in every phase of this study. The present work was supported by the Research Fund of Istanbul University. Project No: 19321 and also TC, Science, Industry and Technology Ministry. Project No: 727. TGSD.2011. 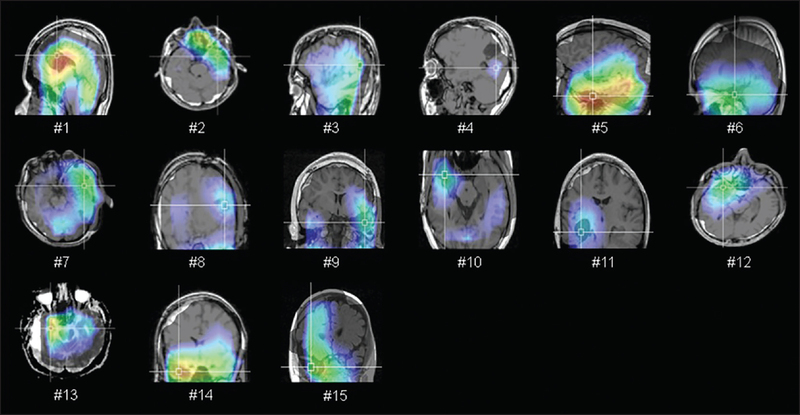 Plummer C, Harvey AS, Cook M. EEG source localization in focal epilepsy: Where are we now? Epilepsia 2008;49:201-18. Makeig S, Debener S, Onton J, Delorme A. Mining event-related brain dynamics. Trends Cogn Sci 2004;8:204-10. Brazier MA. A study of the electric field at the surface of the head. Electroenceph Clin Neurophysiol 1949;2:38-52. Shaw JC, Roth M. Potential distribution analysis II: A theoretical consideration of its signiﬁcance in terms of electrical ﬁeld theory. Electroencephalogr Clin Neurophysiol 1955;7:285-92. Kaiboriboon K, Lüders HO, Hamaneh M, Turnbull J, Lhatoo SD. EEG source imaging in epilepsy - Practicalities and pitfalls. Nat Rev Neurol 2012;8:498-507. Ebersole JS. Noninvasive localization of epileptogenic foci by EEG source modeling. Epilepsia 2000;41:S24-33. Lantz G, Grave de Peralta R, Spinelli L, Seeck M, Michel CM. Epileptic source localization with high density EEG: How many electrodes are needed? Clin Neurophysiol 2003;114:63-9. Michel CM, Murray MM, Lantz G, Gonzalez S, Spinelli L, Grave de Pelta R. EEG Source imaging. Clin Neurophysiol 2004;115:2195-222. Michel C, Lantz G, Spinelli L, De Peralta GR, Landis T, Seeck M. 128-channel EEG source imaging in epilepsy: Clinical yield and localization precision. J Clin Neurophysiol 2004;21:71-83. Gavaret M, Badier JM, Marquis P, Bartolomei F, Chauvel P. Electric source imaging in temporal lobe epilepsy. J Clin Neurophysiol 2004;21:267-82. Gavaret M, Badier JM, Marquis P, McGonigal A, Bartolomei F, Regis J, et al. Electric source imaging in frontal lobe epilepsy. J Clin Neurophysiol 2006;23:358-70. Gavaret M, Trébuchon A, Bartolomei F, Marquis P, McGonigal A, Wendling F, et al. Source localization of scalp-EEG interictal spikes in posterior cortex epilepsies investigated by HR-EEG and SEEG. Epilepsia 2009;50:276-89. Lantz G, Michel CM, Seeck M, Blanke O, Spinelli L, Thut G, et al. Space-oriented segmentation and 3-dimensional source reconstruction of ictal EEG patterns. Clin Neurophysiol 2001;112:688-97. Boon P, D'Havé M, Vanrumste B, Van Hoey G, Vonck K, Van Walleghem P, et al. Ictal source localization in presurgical patients with refractory epilepsy. J Clin Neurophysiol 2002;19:461-8. Holmes MD, Brown M, Tucker DM. Are "generalized" seizures truly generalized? Evidence of localized mesial frontal and frontopolar discharges in absence. Epilepsia 2004;45:1568-79. Beniczky S, Oturai PS, Alving J, Sabers A, Herning M, Fabricius M. Source analysis of epileptic discharges using multiple signal classification analysis. Neuroreport 2006;17:1283-7. Ding L, Worrell GA, Lagerlund TD, He B. Ictal source analysis: Localization and imaging of causal interactions in humans. Neuroimage 2007;34:575-86. Foldvary N, Klem G, Hammel J, Bingaman W, Najm I, Luders H. The localizing value of ictal EEG in focal epilepsy. Neurology 2001;57:2022-8. Koessler L, Benar C, Maillard L, Badier JM, Vignal JP, Bartolomei F, et al. Source localization of ictal epileptic activity investigated by high resolution EEG and validated by SEEG. Neuroimage 2010;51:642-53. Meijs JW, Bosch FG, Peters MJ, Lopes da Silva FH. On the magnetic field distribution generated by a dipolar current source situated in a realistically shaped compartment model of the head. Electroencephalogr Clin Neurophysiol 1987;66:286-98. Hamalainen M, Sarvas J. Realistic conductor geometry model of the human head for interpretation of neuromagnetic data. IEEE Trans Biomed Eng 1989;36:165-71. Cuffin BN. Effects of head shape on EEG's and MEG's. IEEE Trans Biomed Eng 1990;37:44-52. Cuffin BN. Effects of local variations in skull and scalp thickness on EEG's and MEG's. IEEE Trans Biomed Eng 1993;40:42-8. Cuffin BN. EEG localization accuracy improvements using realistically shaped head models. IEEE Trans Biomed Eng 1996;43:299-303. Thevenet M, Bertrand O, Perrin F, Dumont T, Pernier J. The finite element method for the realistic head model of electrical brain activities: Preliminary results. Clin Phys Physiol Meas 1991;12:89-94. Roth BJ, Balish M, Gorbach A, Sato S. How well does a three-sphere model predict positions of dipoles in a realistically shaped head? Electroencephalogr Clin Neurophysiol 1993;87:175-84. Menninghaus E, Lutkenhoner B, Gonzales SL. Localization of a dipolar source in a skull phantom: Realistic versus spherical model. IEEE Trans Biomed Eng 1994;41:986-9. Gençer NG, Tanzer IO, Özdemir MK, Acar CE, Sungur M. State of art in realistic head modeling for electro-magnetic source imaging of the human brain. Elektrik 1998;6:167-82. Brodbeck V, Spinelli L, Lascano AM, Pollo C, Schaller K, Vargas M, et al. Electrical source imaging for presurgical focus localization in epilepsy patients with normal MRI. Epilepsia 2010;51:583-91. Sperli F, Spinelli L, Seeck M, Kurian M, Michel CM, Lantz G. EEG source imaging in pediatric epilepsy surgery: A new perspective in presurgical workup. Epilepsia 2006;47:981-90. Leijten FS, Huiskamp G. Interictal electromagnetic source imaging in focal epilepsy: Practices, results and recommendations. Curr Opin Neurol 2008;21:437-45. Brodbeck V, Lascano AM, Spinelli L, Seeck M, Michel CM. Accuracy of EEG source imaging of epileptic spikes in patients with large brain lesions. Clin Neurophysiol 2009;120:679-85. Blume WT, Ganapathy GR, Munoz D, Lee DH. Indices of resective surgery effectiveness for intractable nonlesional focal epilepsy. Epilepsia 2004;45:46-53. Pascual-Marqui RD, Michel CM, Lehmann D. Low resolution electromagnetic tomography: A new method for localizing electrical activity in the brain. Int J Psychophysiol 1994;18:49-65. Fuchs M, Wagner M, Kohler T, Wischmann HA. Linear and nonlinear current density reconstructions. J Clin Neurophysiol 1999;16:267-95.
de Peralta Menendez RG, Andino SL. Discussing the capabilities of Laplacian minimization. Brain Topogr 2000;13:97-104. Trujillo-Barreto NJ, Aubert-Vazquez E, Valdes-Sosa PA. Bayesian model averaging in EEG/MEG imaging. Neuroimage 2004;21:1300-19. Koessler L, Maillard L, Benhadid A, Vignal JP, Braun M, Vespignani H. Spatial localization of EEG electrodes. Clin Neurophysiol 2007;37:97-102. Pascual-Marqui RD, Esslen M, Kochi K, Lehmann D. Functional imaging with low-resolution brain electromagnetic tomography (LORETA): A review. Methods Find Exp Clin Pharmacol 2002;24:91-5. Liu H, Schimpf PH, Dong G, Gao X, Yang F, Gao S. Standardized shrinking LORETA-FOCUSS (SSLOFO): A new algorithm for spatio-temporal EEG source reconstruction. IEEE Trans Biomed Eng 2005;52:1681-91. Worrell GA, Lagerlund TD, Sharbrough FW, Brinkmann BH, Busacker NE, Cicora KM, et al. Localization of the epileptic focus by low-resolution electromagnetic tomography in patients with a lesion demonstrated by MRI. Brain Topogr 2000;12:273-82. Zumsteg D, Friedman A, Weiser HG, Wennberg RA. Source localization of interictal epileptiform discharges: Comparison of three different techniques to improve signal to noise ratio. Clin Neurophysiol 2006;117:562-71. Clemens B, Bessenyei M, Fekete I, Puskás S, Kondákor I, Tóth M, et al. Theta EEG source localization using LORETA in partial epilepsy patients with and without medication. Clin Neurophysiol 2010;121:848-58. Pascual-Marqui RD. Discrete, 3D distributed, linear imaging methods of electric neuronal activity. Part 1: Exact, zero error localization 2007;arXiv:0710.3341.